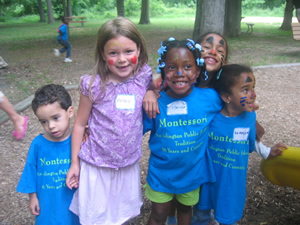 The Montessori multi-age program in Arlington Public Schools extends from age 3 to 8th grade. In Montessori classrooms, children engage in activities of their own choice in a well ordered physical environment. Montessori-trained children develop self-discipline, love of order and concentrated attention to and interest in intellectual activity. APS currently hosts primary classrooms (ages 3-Kindergarten) in several APS elementary schools. In addition, The Montessori Public School of Arlington is the only elementary school in Arlington Public Schools that offers the Montessori program with multi-age Lower Elementary (grades 1-3) and Upper Elementary (grades 4 & 5) classrooms. In 2007, APS founded the Montessori Middle School Program (grades 6-8). The Montessori program at Drew is countywide and available to all Arlington students. The Arlington Public School’s Montessori program was one of the first publicly funded programs in the country. In 1970 Arlington established a half-day multi-age classroom or "children's house." The School Board funded a single classroom at Drew Model School in 1971 as a pilot program. The preschool Montessori programs became full day with the advent of full-day kindergarten in 1993. In 1995, Michael Grinder, former Drew principal, wrote a proposal to extend the Montessori program into the elementary grades. Drew hosted this county-wide program and recruited a diverse group of students. During the last 35 years, the Montessori program has experienced a variety of changes including increased enrollment and funding of programmatic needs, the establishment of a highly qualified and credentialed teaching force, on-going professional development, and strong community support. The APS Montessori program has endured in the public setting due to the broad support of teachers, parents, and division administrators. RESOLVED, that the Boards encourage the citizens celebrate Montessori Day with appropriate festivities the movement by dedicating themselves to efforts to center of society and to assist them in becoming transforming leading to a harmonious and peaceful humanity.